EIRNS—In an unprecedented, harshly worded Sept 3 opinion piece on German-language RT, former assistant German Defence Minister Willy Wimmer warns of a situation after Election Day on Nov. 6 in the United States, in which President Trump’s opponents would win enough races to remove him from office. This, Wimmer writes, would be the prelude to a (nuclear) war against Russia, the foremost enemy of the circles identified with the names of John McCain and Hillary Clinton. "The hate potential of Anglo-Saxon global media, means that this is not going to be the normal or even escalated confrontation, but rather that it is the road to the annihilation of the assumed enemy of the U.S. war coalition. This gives you an idea of the power of the deep state," [actually the British empire] Wimmer writes. The buildup for the confrontation has been assiduously pursued in Europe during recent years, so that the removal of Trump from office "would be the breaking of the dam that is keeping the fragile peace alive." The obituaries for the deceased Sen. John McCain show "where the heart of European heads of government beats, and there is also George Soros with his campaign against Trump, a campaign now pursued from his new European HQ in Berlin." All of that contradicts the lessons that Germans were supposed to have learned from two world wars, namely that only peace would issue from German territory in the future—that no war of aggression would be conducted from Germany. Instead, Germany is supporting Ukrainian fascist combat units moving against the Russian-speaking population in their own country, with billions of euros. 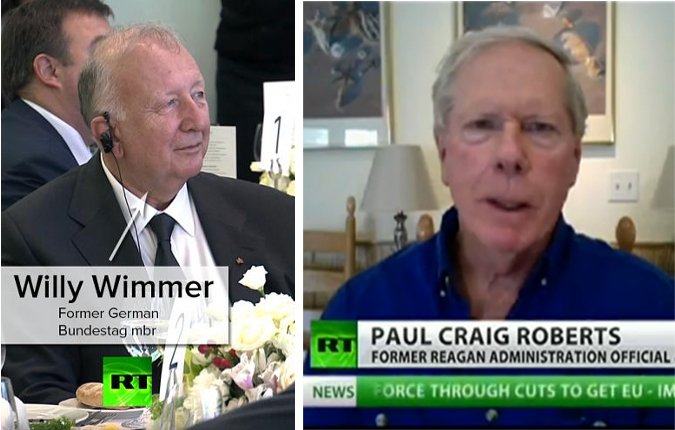 Sept 6—Paul Craig Roberts, who was Assistant Secretary of the Treasury for Economic Policy under President Reagan, wrote an article Sept 4 with much the same argument as Willy Wimmer’s. "Donald Trump was the only candidate for president who emphasized the necessity of normalizing relations with the other major nuclear power. The military/security complex saw this commitment as a threat to their massive budget and power and orchestrated `Russiagate’ in order to prevent President Trump from normalizing relations with Russia. "The CIA-led attack on President Trump has had the full support of the Democrats and the liberal-progressive-left who are agitating for the impeachment of President Trump, thereby removing the only politician with enough wits to see the danger in the extremely high tensions between Washington and Russia.